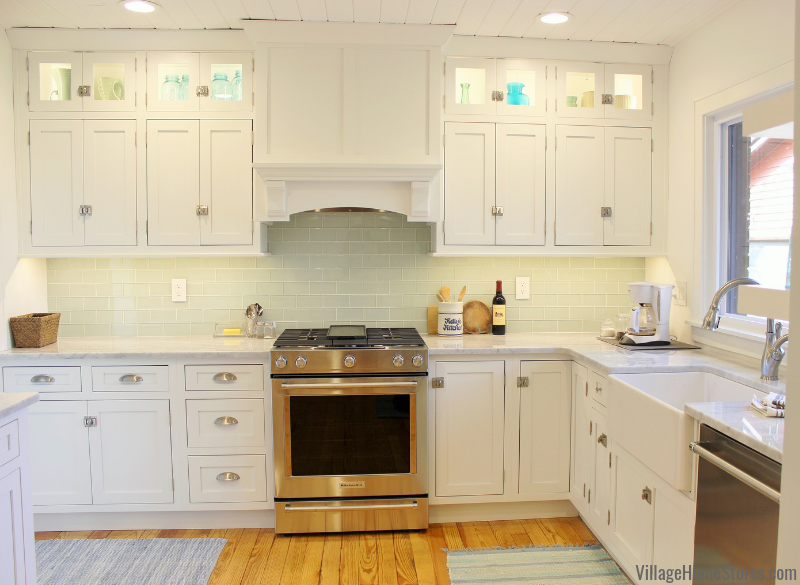 We are so excited to share this kitchen feature with you because we know that this finished space is a perfect match to many of our reader’s own taste. When the term “Farmhouse” or “Modern Farmhouse” gets used that can truly mean a number of things. Just like any style term, it can mean something different to each person. 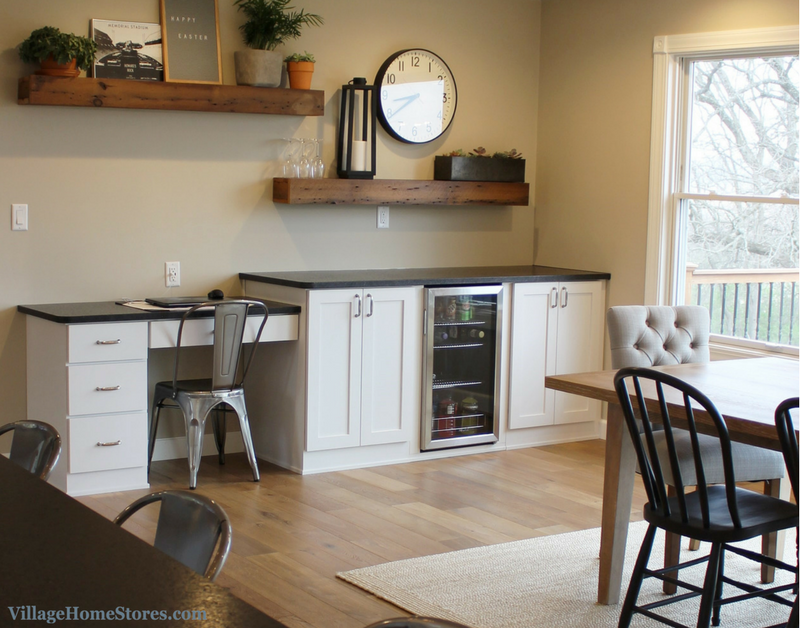 But when your home has panoramic views of the Midwest countryside plus all of these great farmhouse details we think Modern Farmhouse is just the right fit. 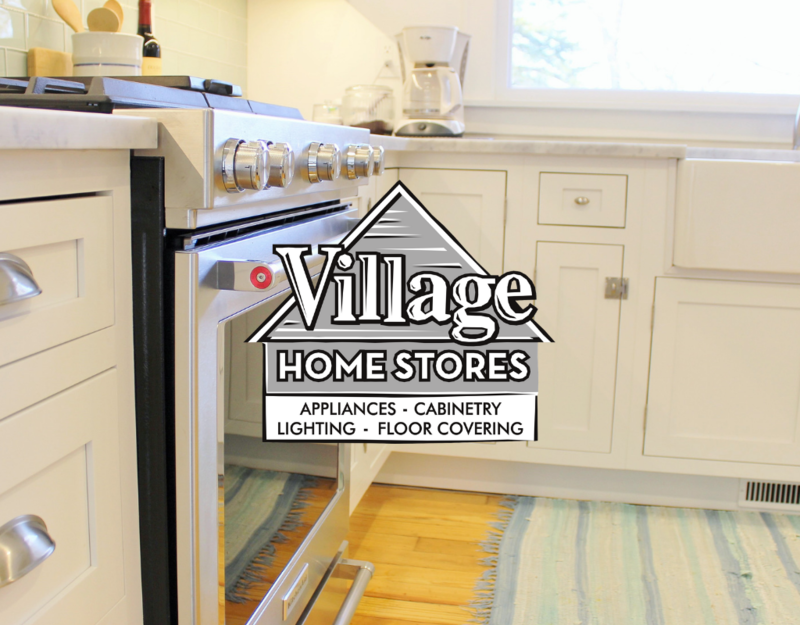 We hope to be able to share this full kitchen story on the Village Home Show sometime soon. And who are we kidding? You came here to see the finished kitchen! 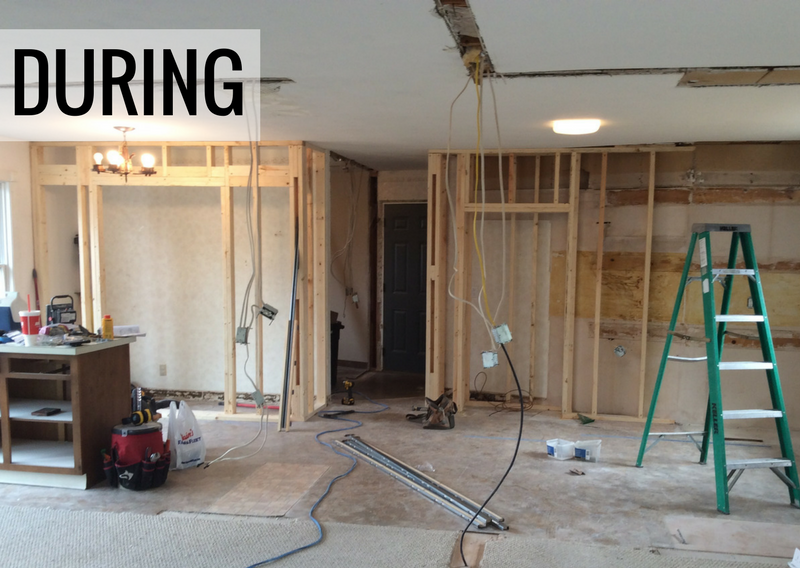 For the sake of this blog feature we do want to give you some sense of how far this space has come during the transformation. 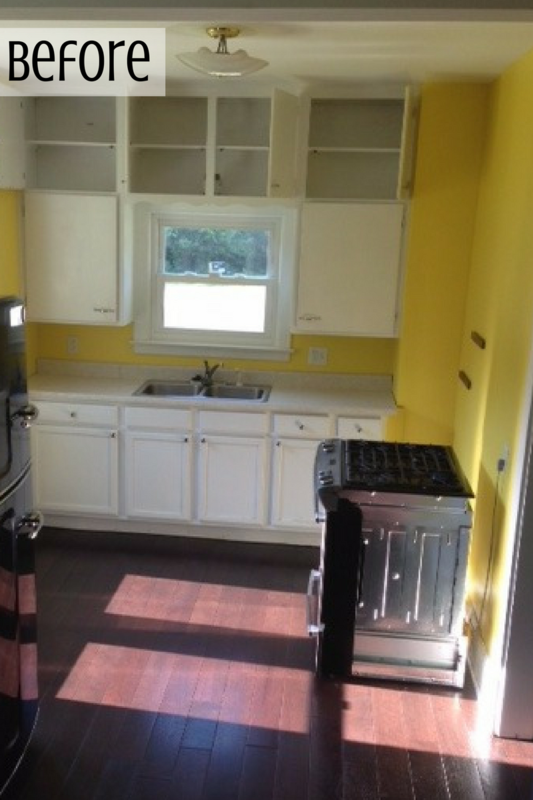 The original kitchen and dining room spaces were divided by a center wall. 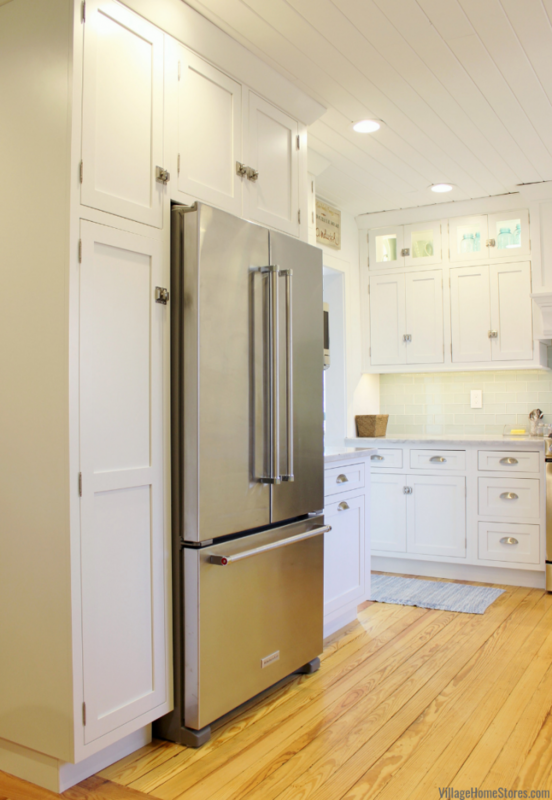 The cramped kitchen had cabinetry in a medium wood with dated countertops. Bottom line: the busiest room of the house did not match this family’s lifestyle or reflect their personal tastes. 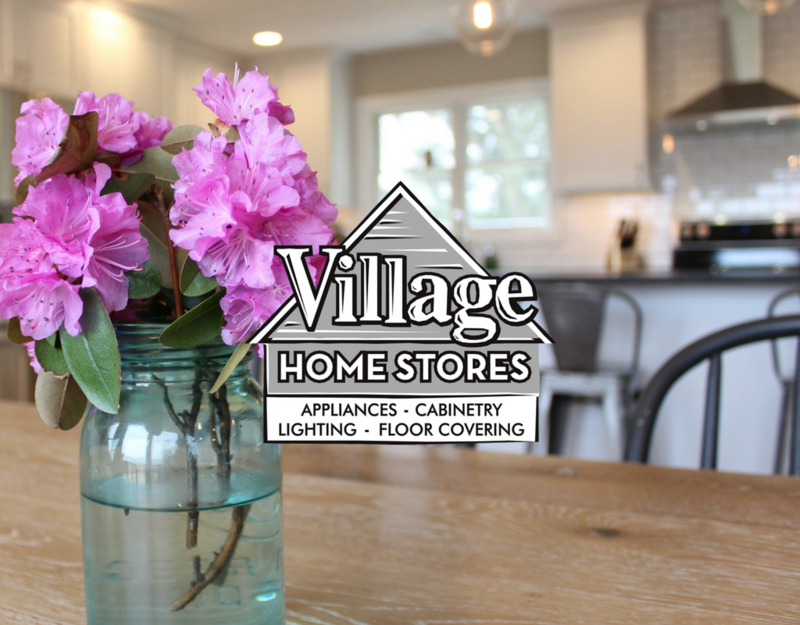 The complete Project Management program at Village Home Stores is available for those who are ready for not just the expert design and material selection, but our entire proven process. We coordinate everything from the very beginning until the final walk-through. 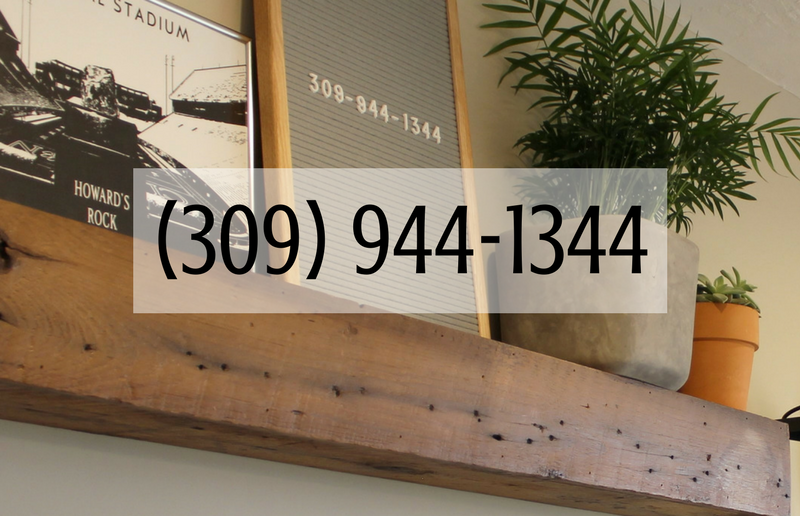 Estimates are prepared in detail based on meetings involving ALL PARTIES. That helps to keep the scheduling and communication as seamless as possible once work begins. 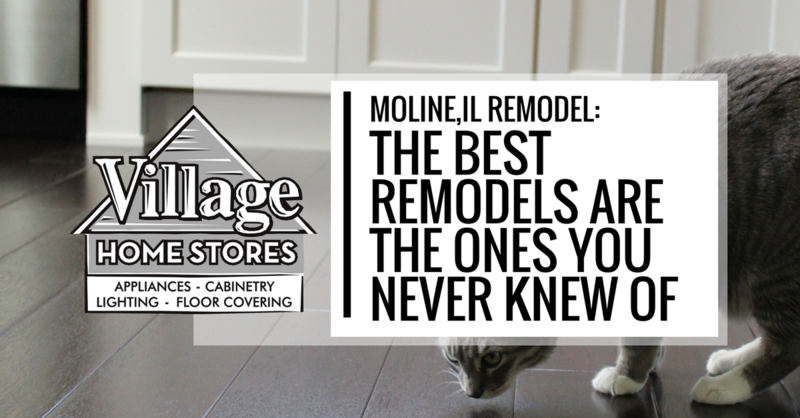 This kitchen remodel involved a full team of experts from Village Home Stores along with carpenters, electricians, plumbers, plasterworkers, flooring, and tile installers. The end result is a show-stopping take on the Modern Farmhouse style. 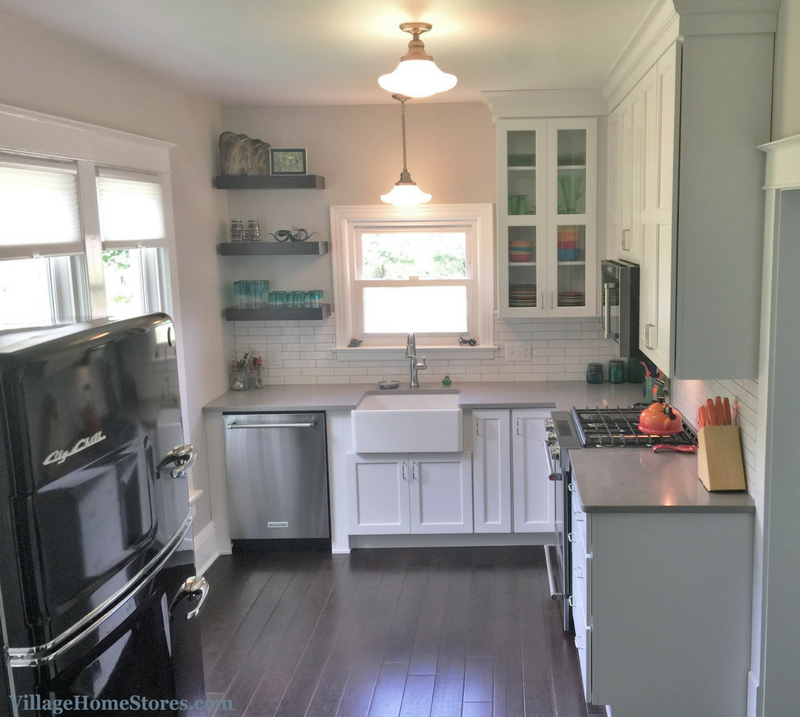 Now the kitchen has opened up into a large great room space including a dining room, a desk/bar area, and nearby family room. 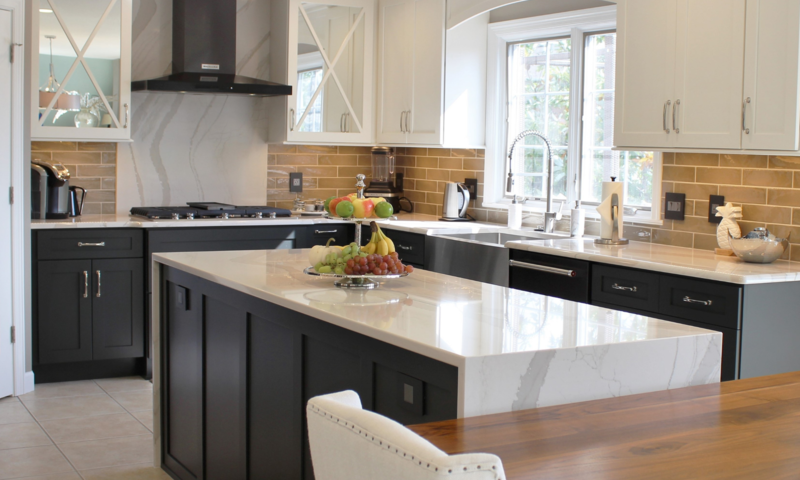 A long kitchen island provides a versatile space for storage, worksurface, and even dining. Natural light pours into the space from the sliding glass doors facing the back of the property. New light oak hardwood flooring has been installed throughout and it is the perfect platform to showcase the new kitchen and furnishings. The floor is from Hallmark Floors in their “Novella” series and “Twain” finish. 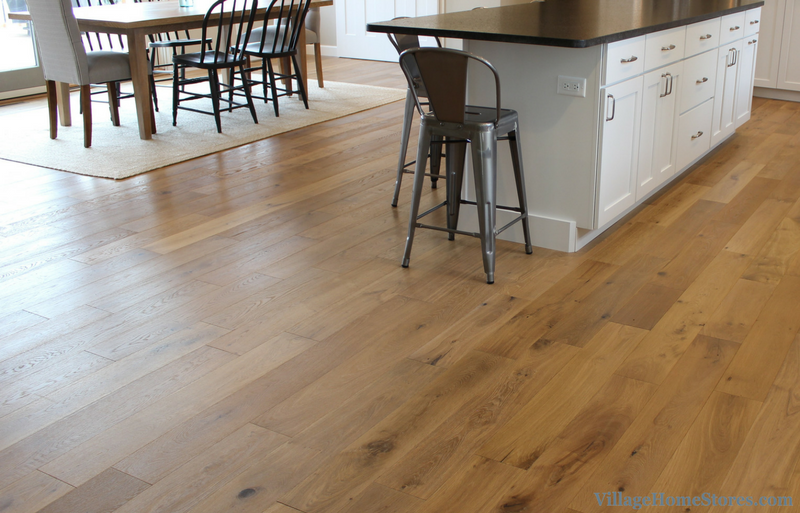 The hardwood gives a natural look and feel to the room but without too much wild variation in color from plank to plank. 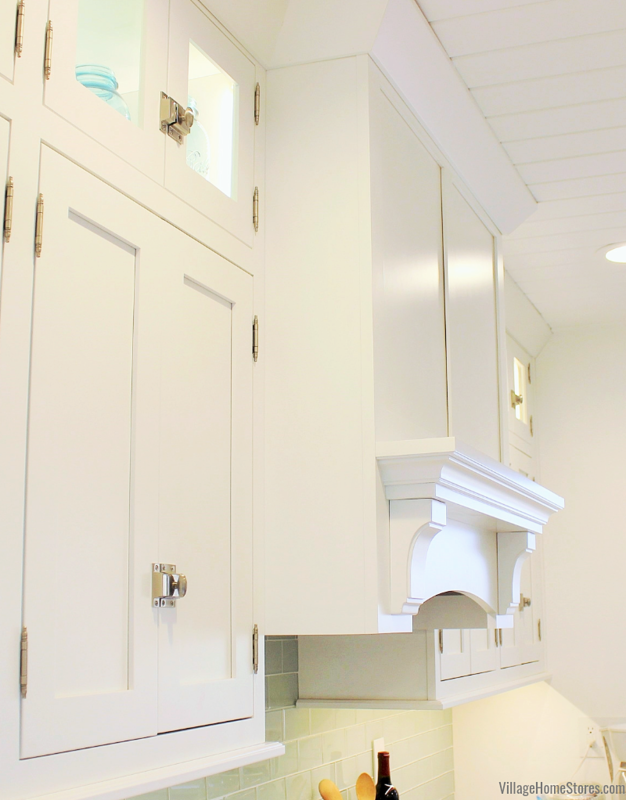 Bright white painted cabinetry from our Koch Classic line has been installed in the “Savannah” doorstyle. 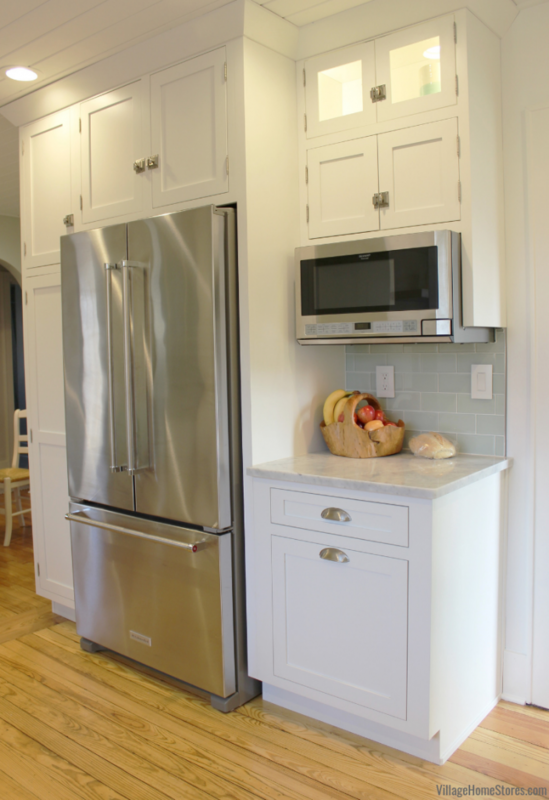 The classic, flat-panel door is the perfect choice for any Transitional kitchen space. This door is considered a “reversed center panel” door. That means that this center (flat) section is not thin or flimsy. 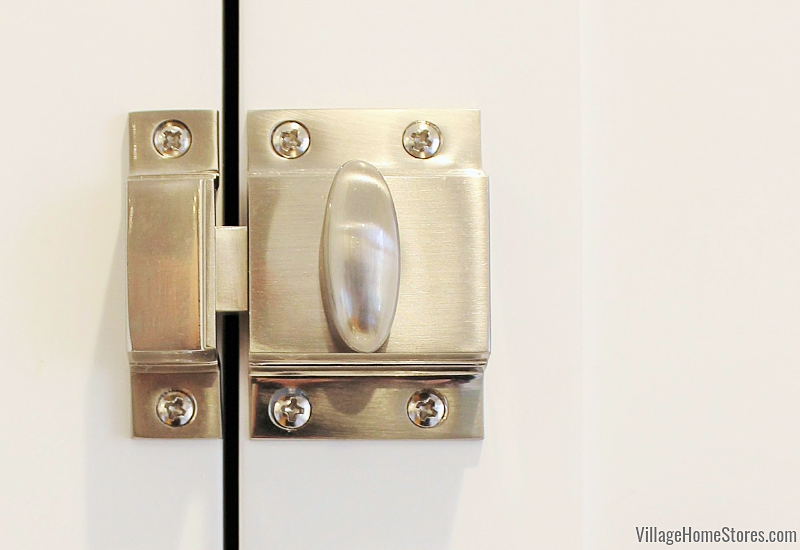 Instead it is a thick, raised panel reverse-installed to make a very solid, sturdy door. An over-the-counter microwave by Sharp® includes 1100 watts and 1.5 cu. ft. capacity. 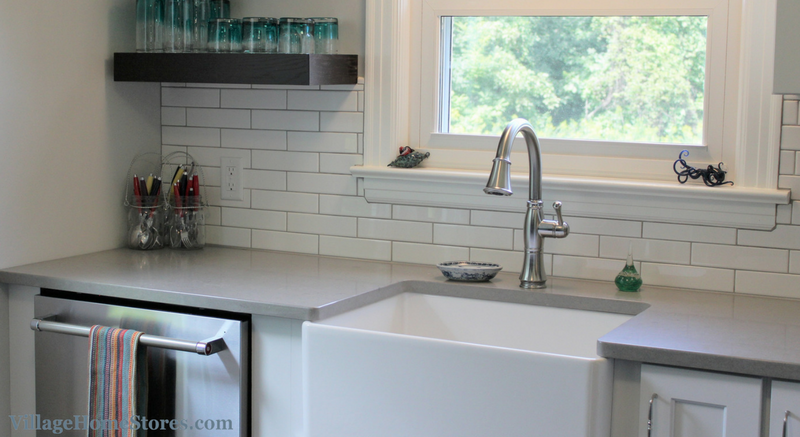 Would you believe that a kitchen we are calling “Modern Farmhouse” doesn’t have a farm sink!?! It’s true! 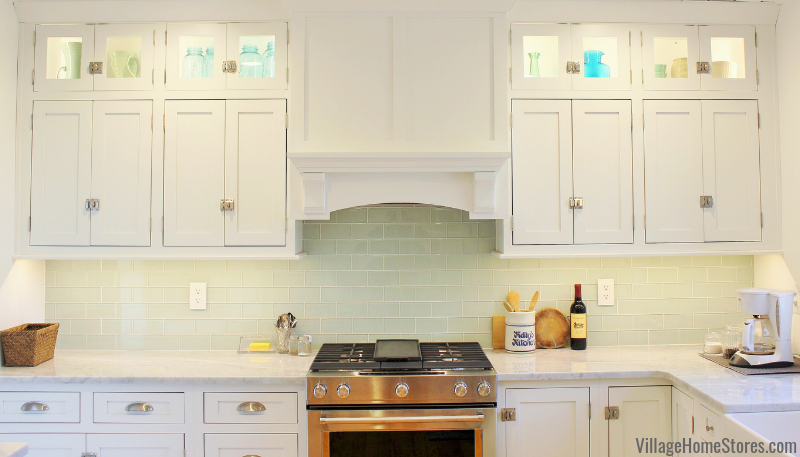 We think this kitchen checks all the right boxes without needing one! 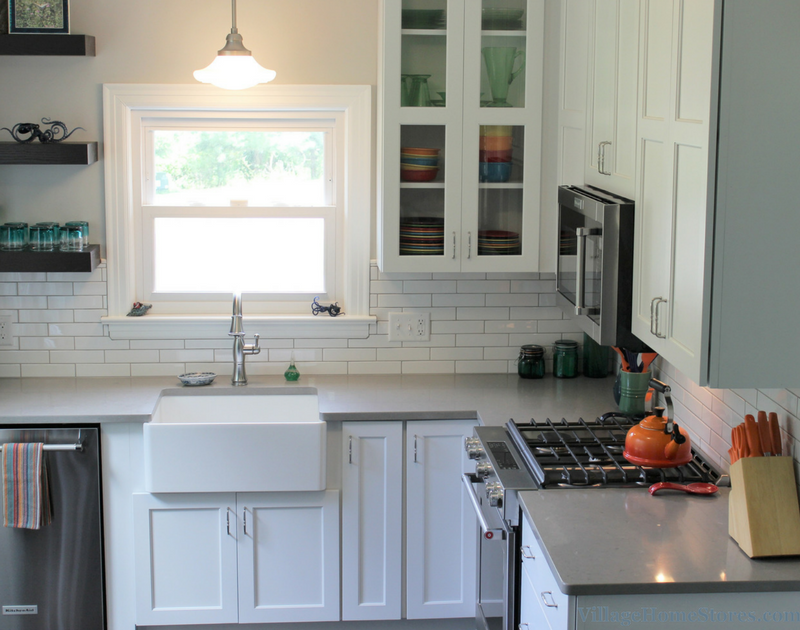 A Stainless Steel sink has been undermounted to the granite tops and a single drill kitchen faucet with pull-out sprayer has been installed. The main focal point of the back wall is the new chimney hood area. 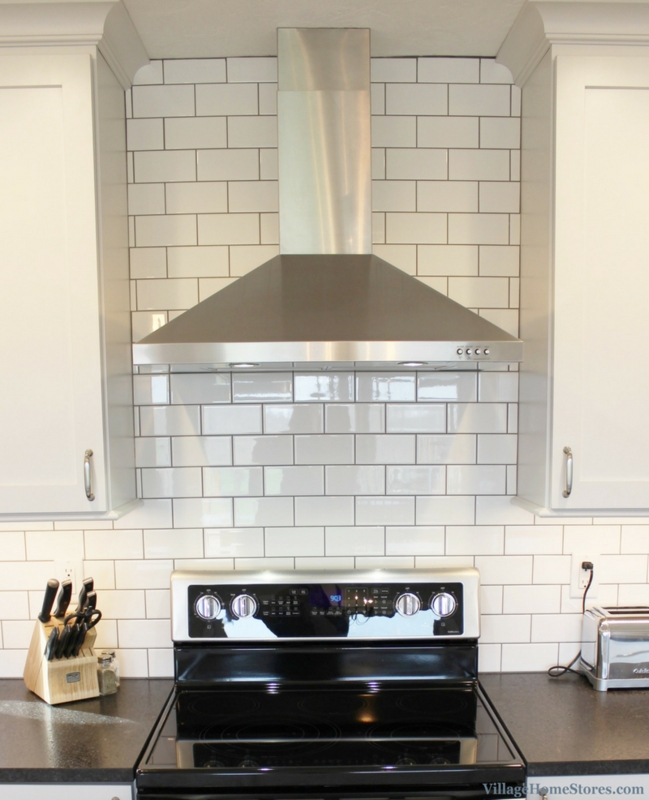 This 30″ wide Stainless hood extends all the way to the ceiling and so does the beautiful new tile. 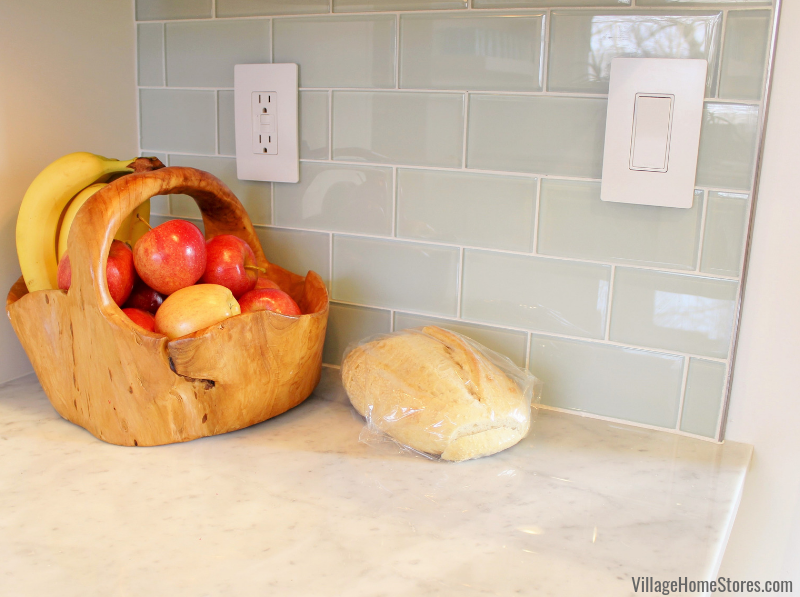 “Glossy White” Subway Tile from our Soho series in a classic 3″ x 6″ size has been installed throughout the kitchen. 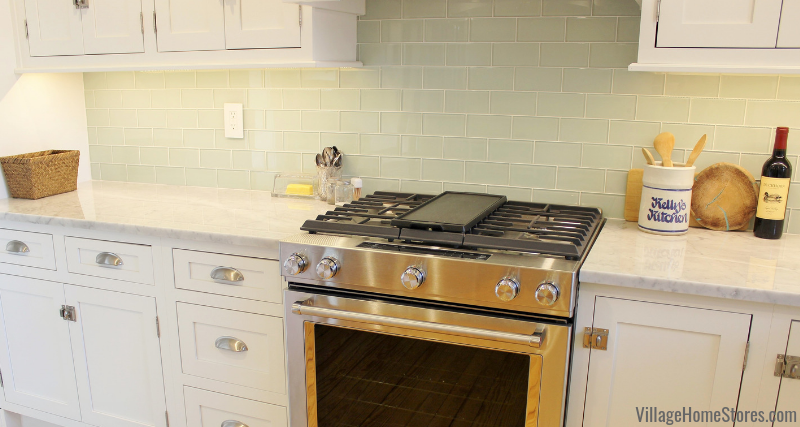 Installing the tile within this entire hood area creates a bright, glossy texture and the shape of the tile helps to draw your eye. 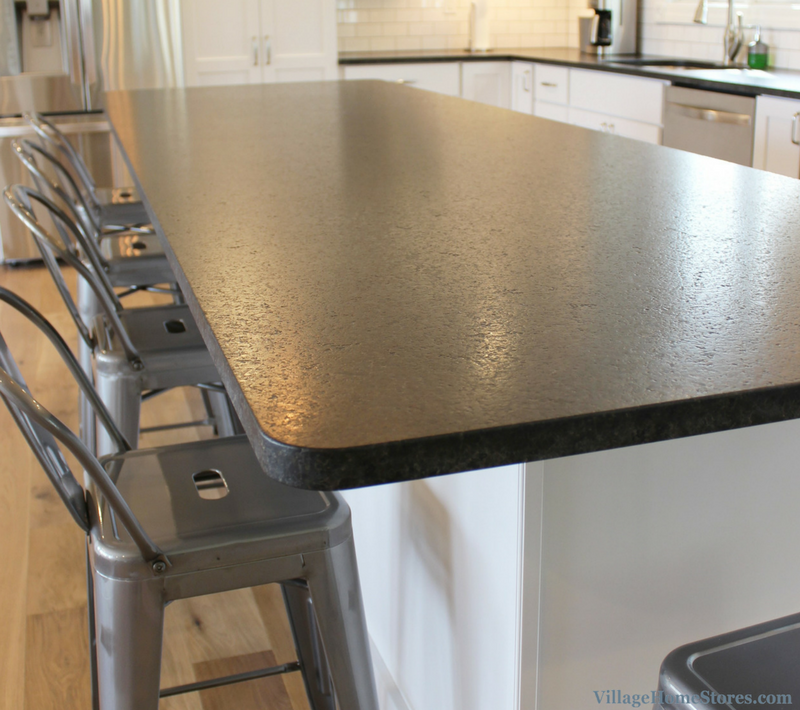 As a contrast to the white glossy tile, a matte finished granite has been selected for the kitchen counters. “Black Pearl” granite in the “Brushed” finish almost gives a leather look to the tops. 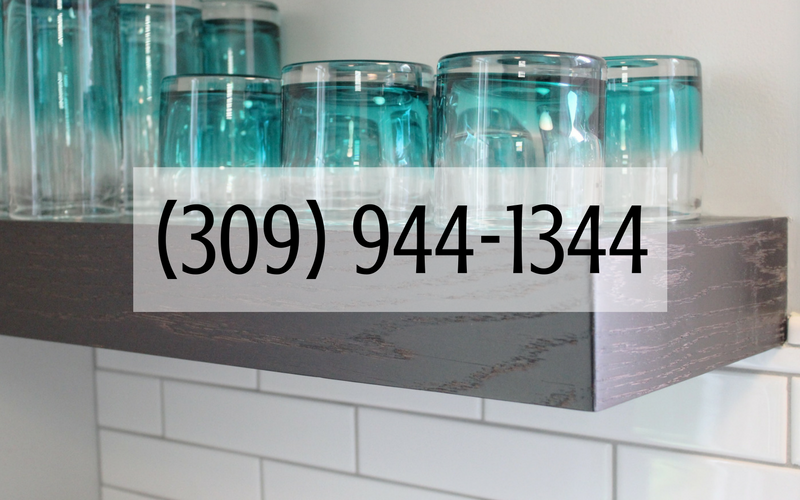 Matte black accents are a huge trend moving into 2017 and in this kitchen that trend is made classic. 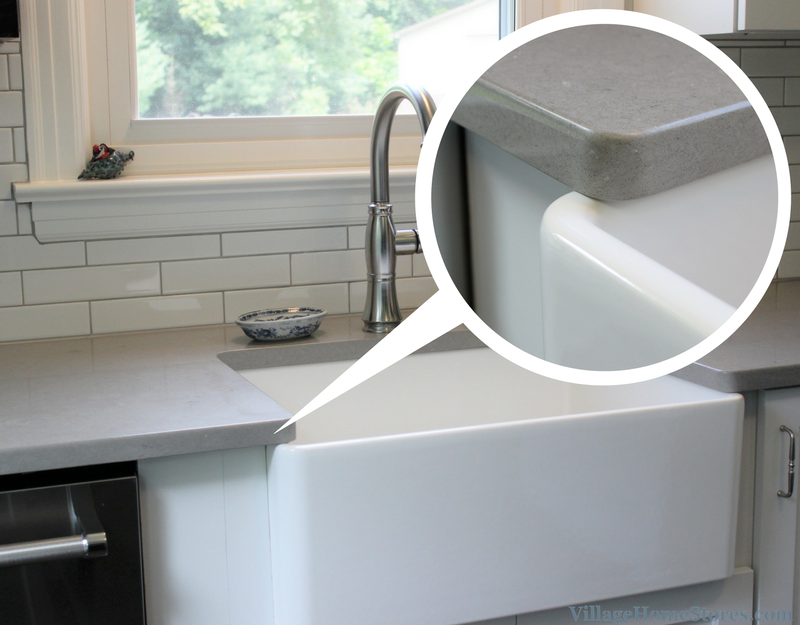 A standard “Eased” edge has been applied to the granite slabs. 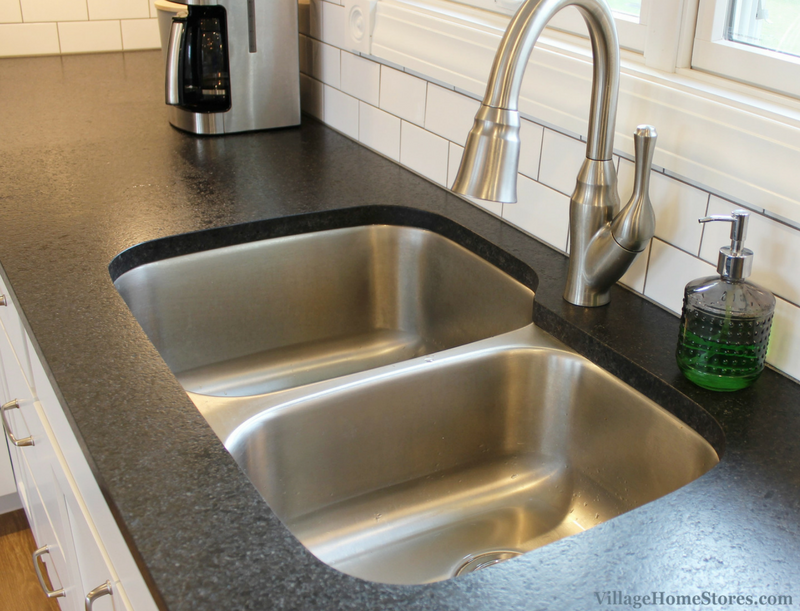 Brushed finished granite add a touchable texture and help to soften the look of stone counters. 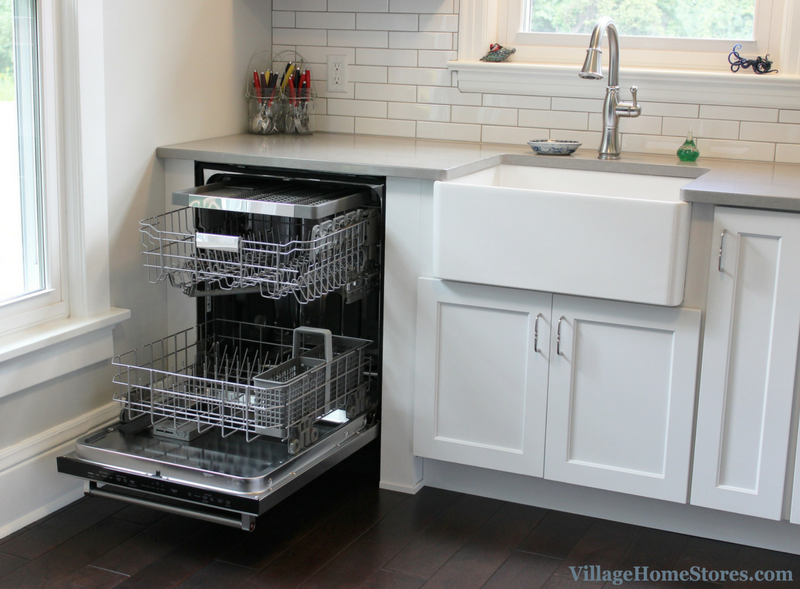 The center island in the new space boasts a large countertop surface but also a lot of great storage below. 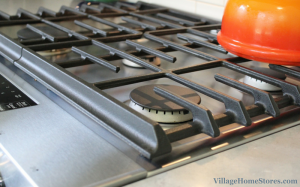 Located at the very center of all activity it is the perfect place for pots and pans storage as well as small appliances and items for food prep. 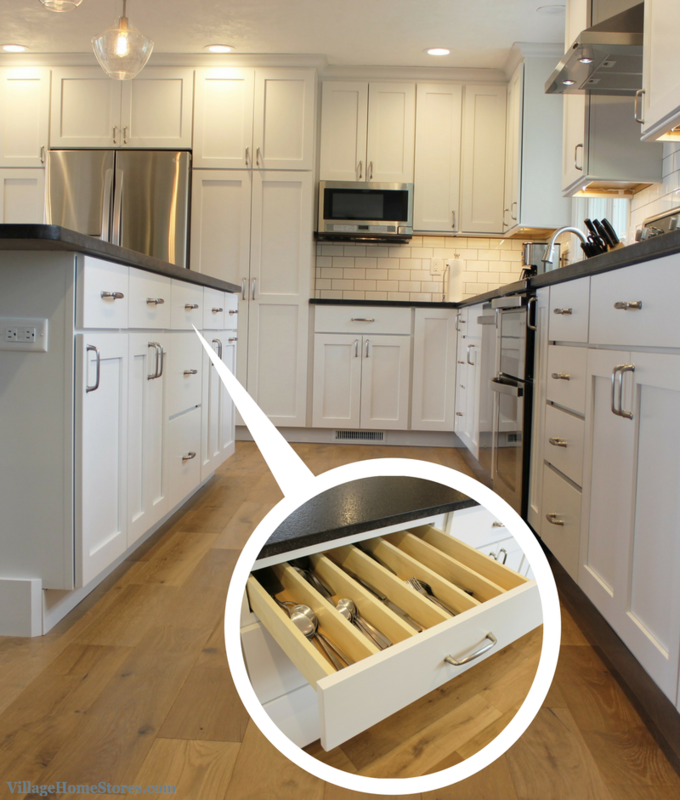 The top center drawer has been ordered to include a divided top drawer for flatware and cutlery. 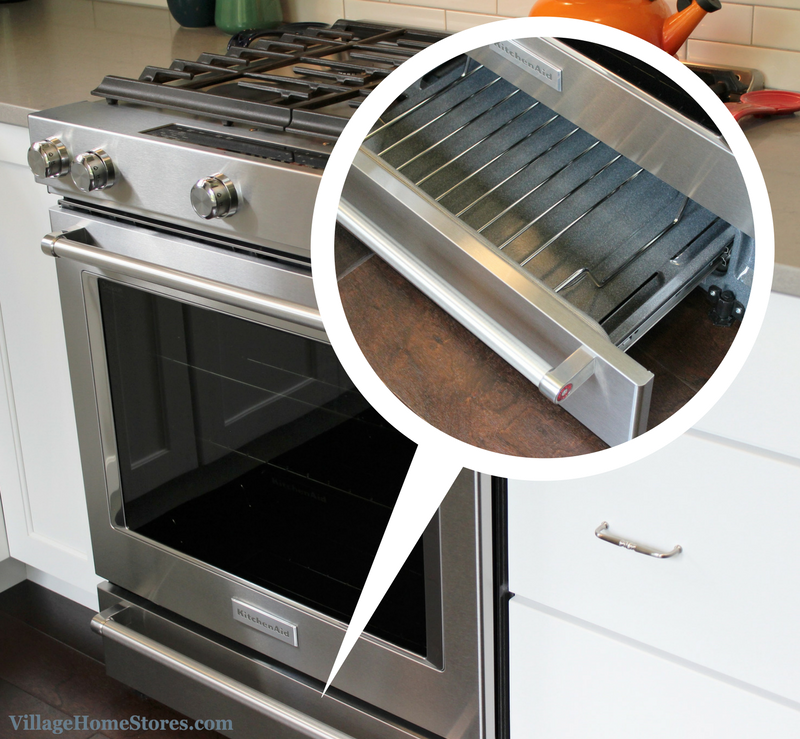 The base cabinets with doors have been fit with adjustable slide-out shelves. 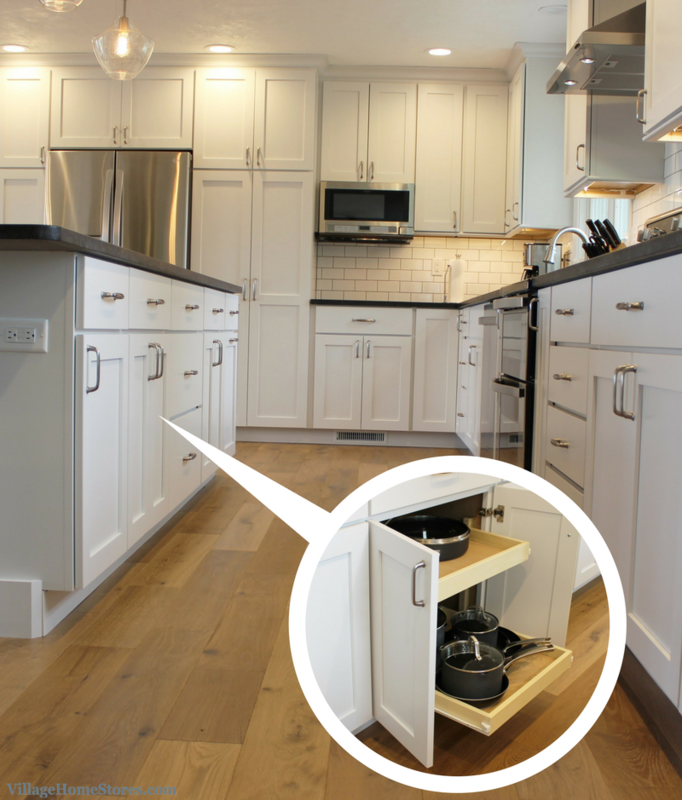 These are ideal for storing pots and pans or keeping other containers and dishes with lids organized. 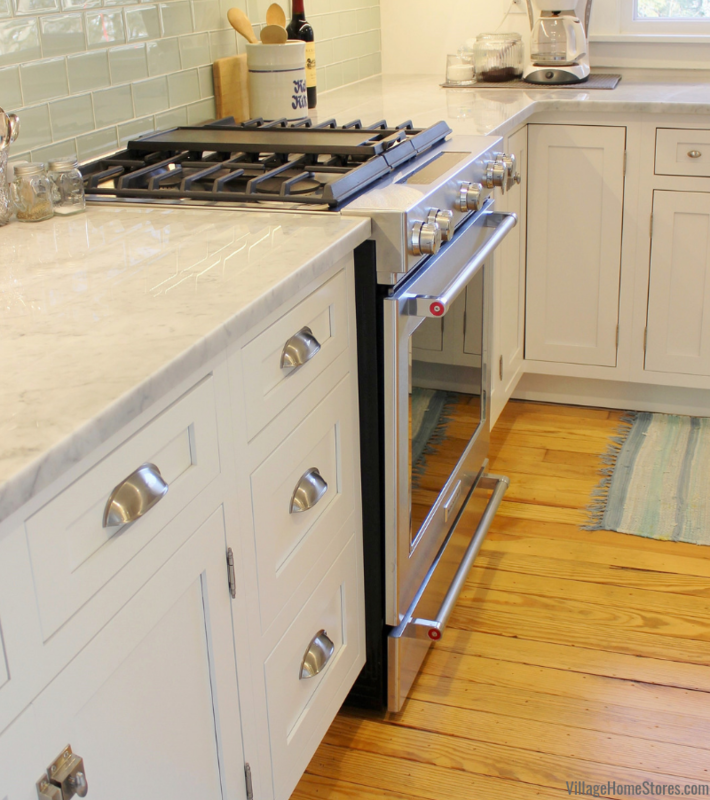 Having this kitchen island directly behind the range area creates a wonderful available surface for prep as well as unloading the double oven when needed. 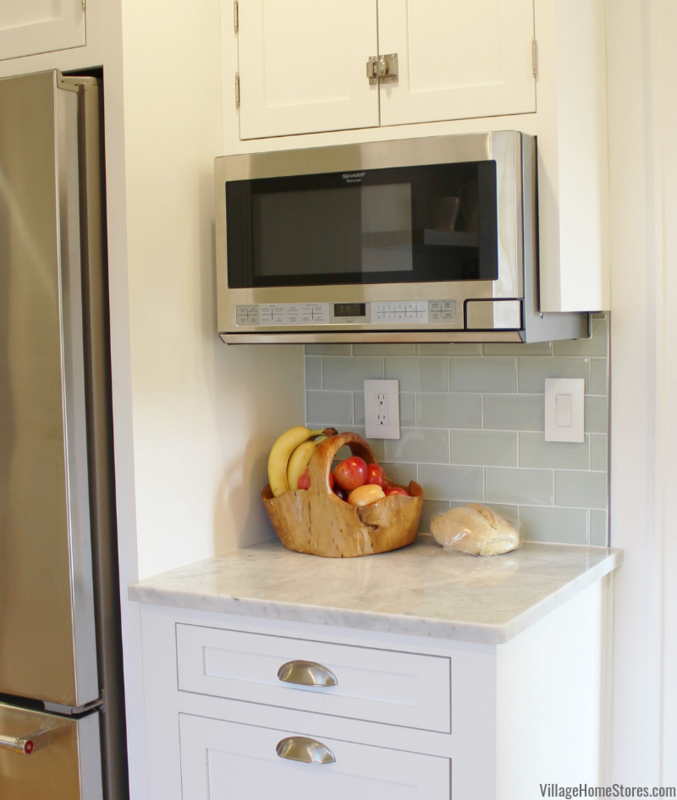 Outlets have also been installed on the end of the kitchen island for easy access for small appliances. 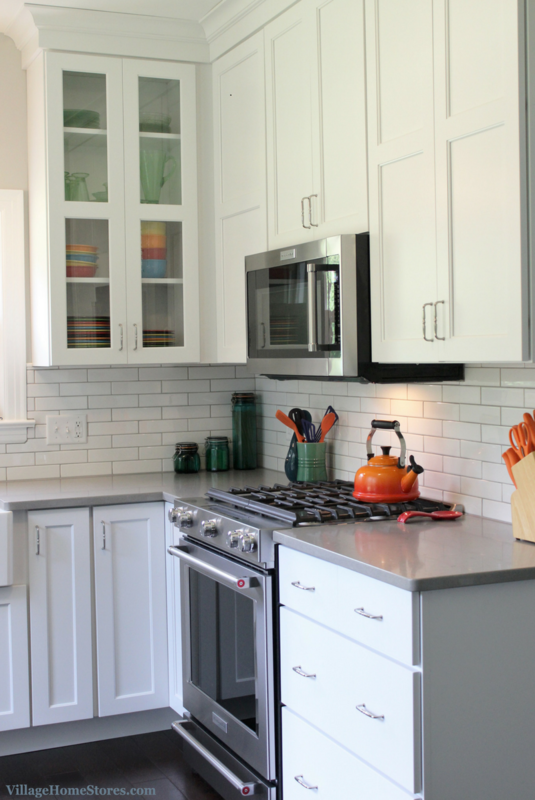 These outlets aren’t only there for a mixer or blender…consider this island in your own home. Would you mind setting up your work-from-home office here or a homework station? If you need a device charged or a laptop plugged in the outlet is right there. 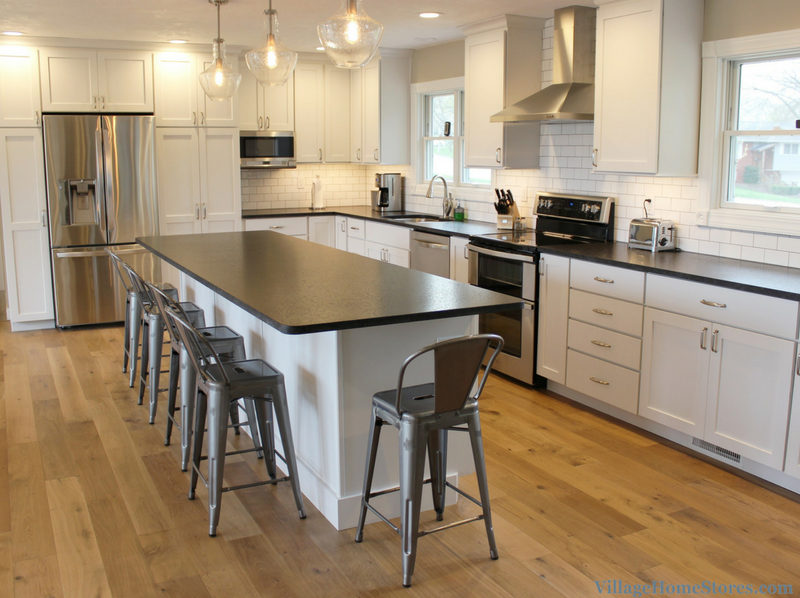 It is important to note that many kitchen islands have become the center of ALL activity. That includes working for many people. 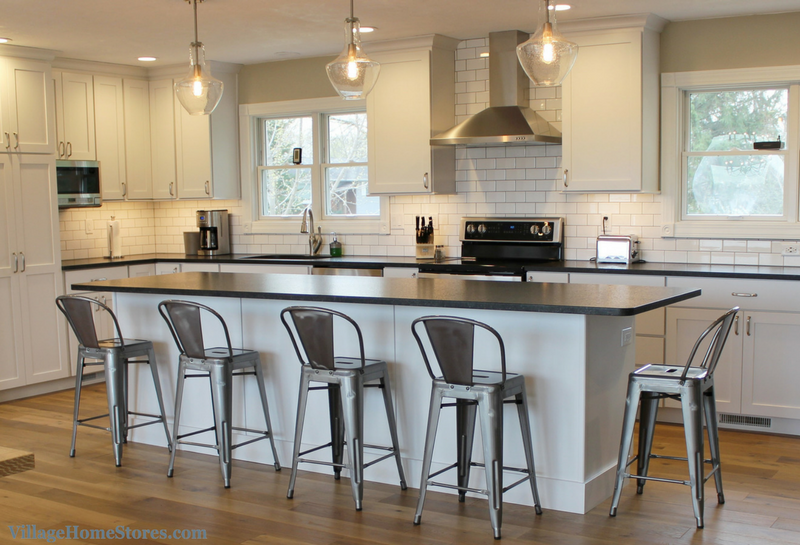 If the island isn’t the right space to work at there is a desk area designated just across the room. 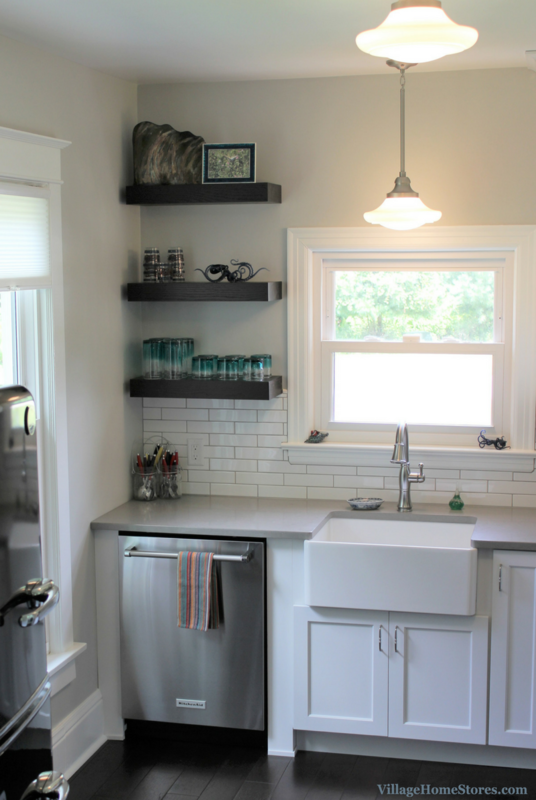 A stack of drawers and counter surface has been dropped down to “desk height” and this workspace is still within eyesight or earshot of anyone working in the kitchen. 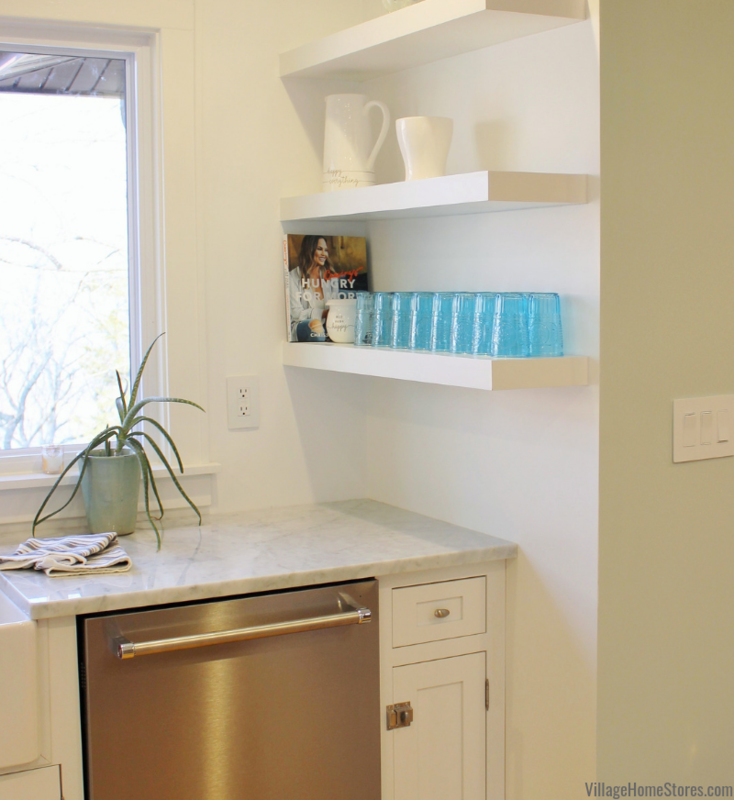 Two full-height door cabinets and a glass-front beverage cooler complete this wall of cabinetry with a versatile location perfect for entertaining. 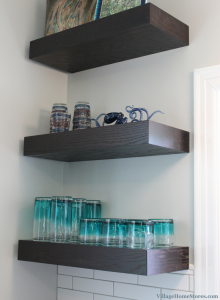 Setting up this counter as a beverage station will be perfect when guests are over. It will not be in the way of anyone working in the kitchen. Now a cold drink is just a few steps inside from the patio doors. 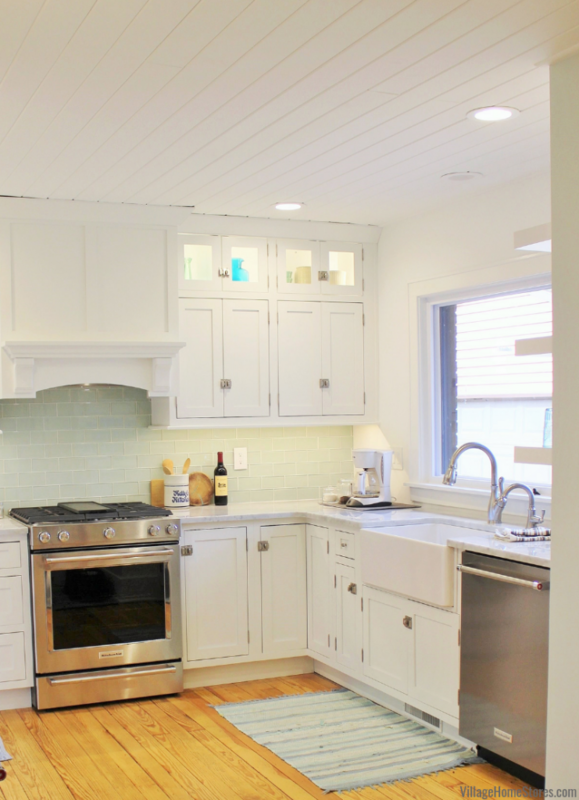 The carpentry work for this remodel was completed by the crew at Durian Builders. 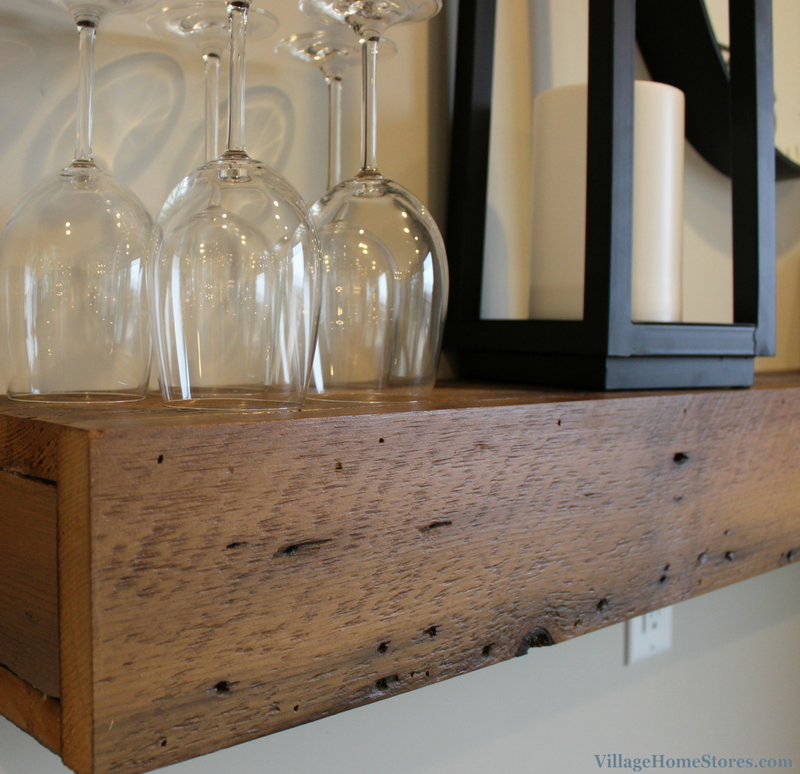 They teamed up with Reclaimed Salvage who provided the reclaimed barnwood for these awesome floating shelves. 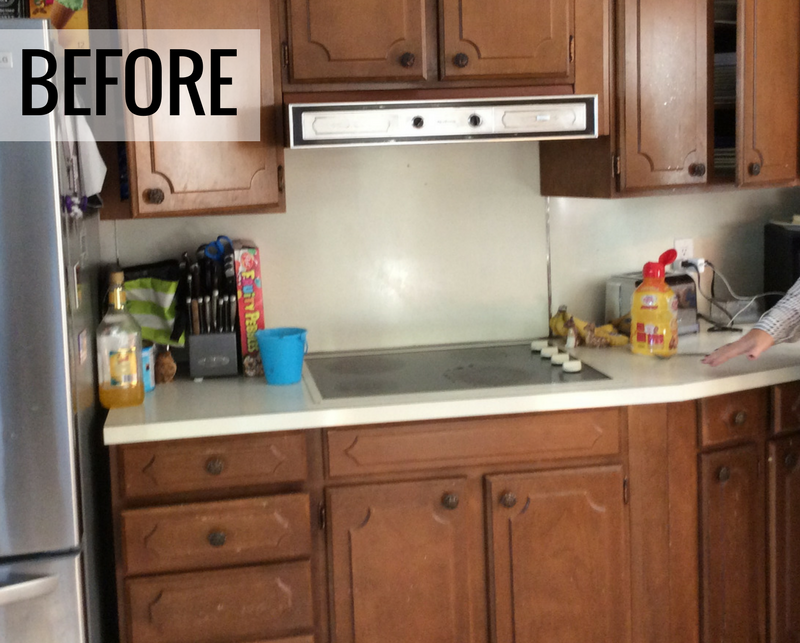 We want to give a special shout out to the homeowner who also took on some projects for this remodel. 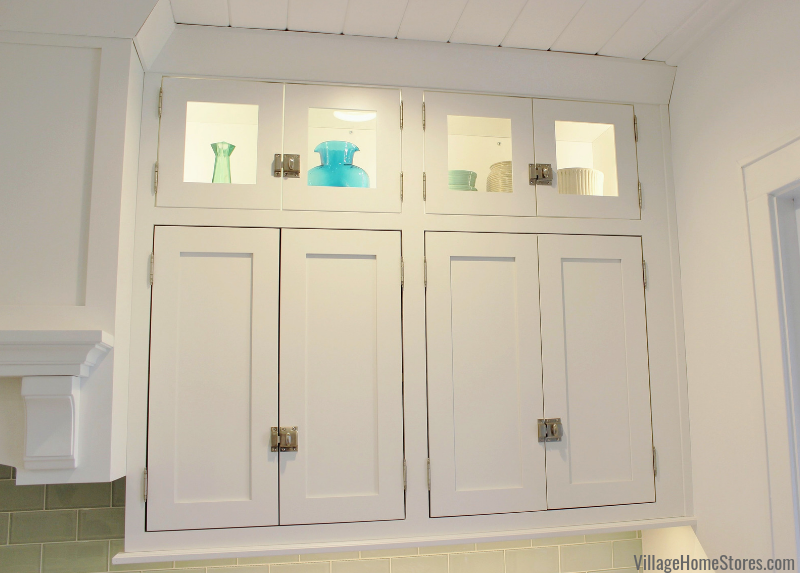 The family room was given a new wall treatment and the pantry barn doors turned out amazing! 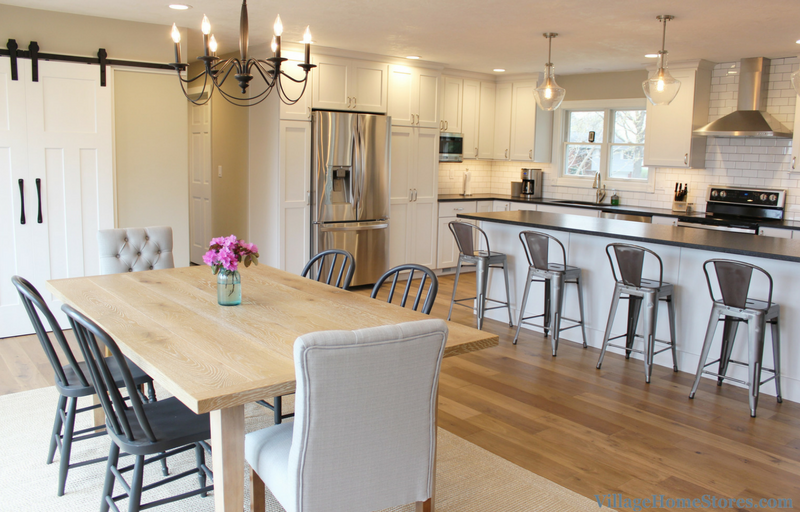 We were so thrilled to help make this space better fit this family in function and style. They were wonderful to work with. 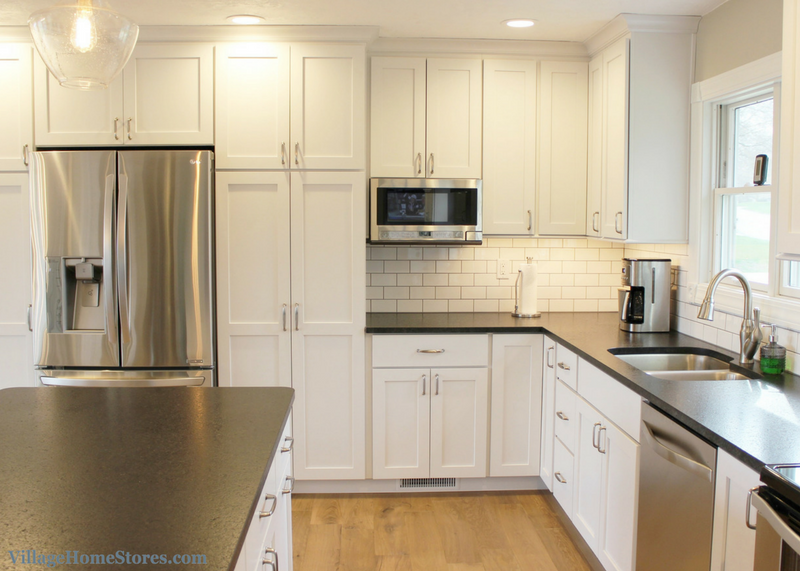 See something in this kitchen that would be on your own dream kitchen wishlist? 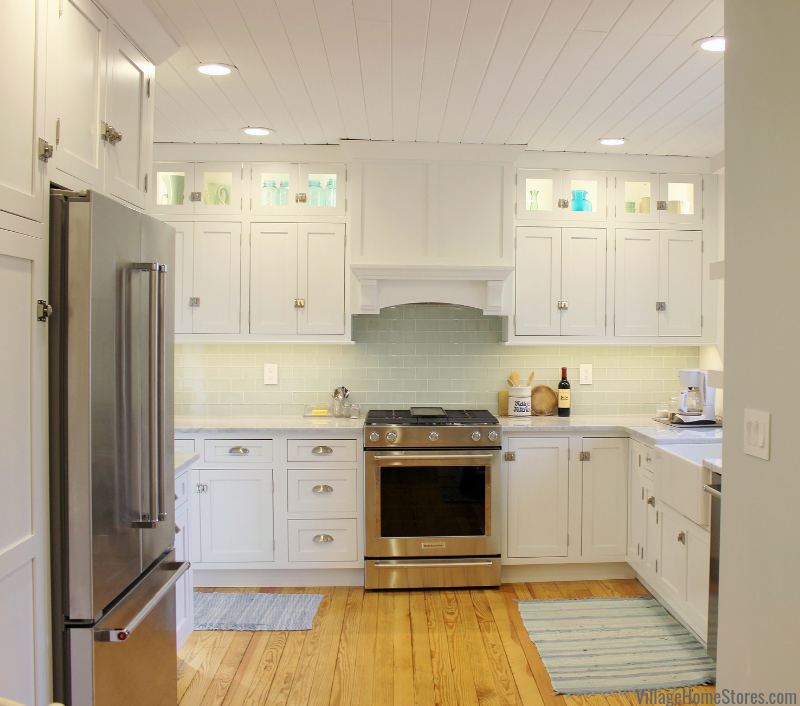 View the full album of over 50 photos from the kitchen remodel here on our award-winning Houzz page. 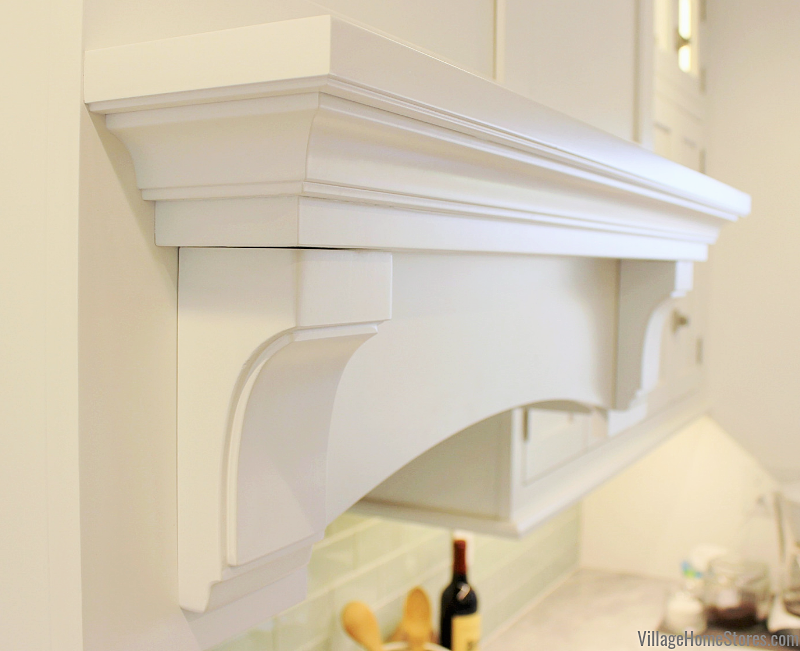 Do you love something special about this kitchen feature? 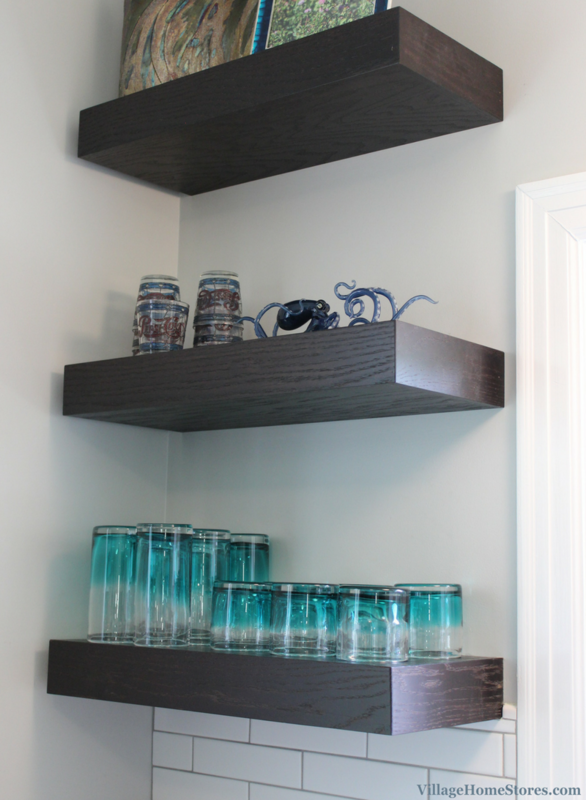 Be sure to save any of these ideas to your own Pinterest boards or Houzz ideabooks. 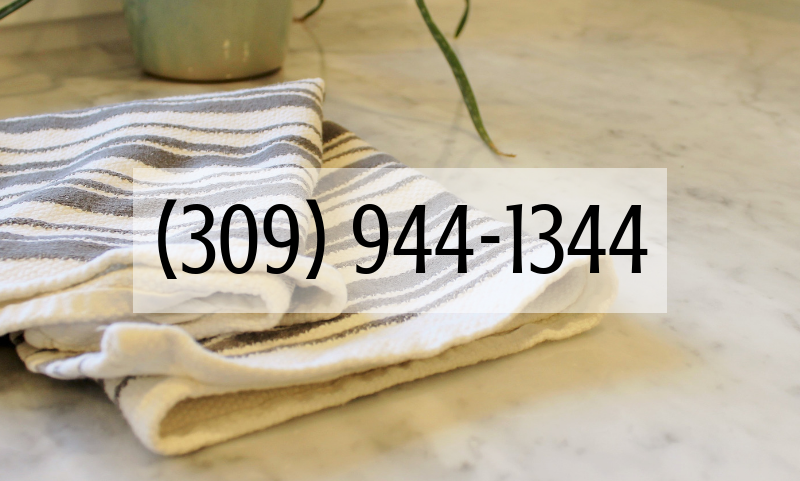 When you are ready to start the conversation about your own project give us a call at (309) 944-1344 or complete this online form and someone from our team will be in touch.